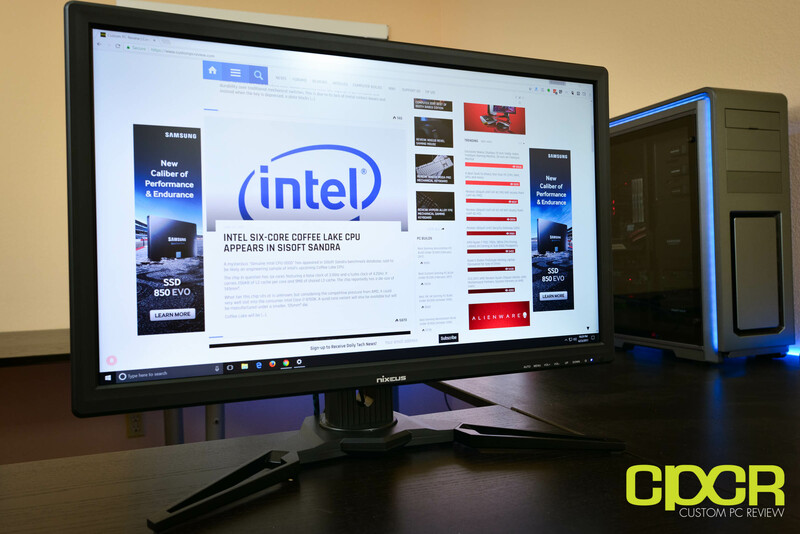 Earlier this year at CES 2017, Nixeus was back at it again, this time around with a the new Nixeus NX-EDG27, a 27-inch gaming monitor featuring a 1440p resolution, AHVA (IPS) display technology, a 144Hz refresh rate, and once again it’s the first monitor of its kind to be offered with the 30Hz – 144Hz refresh rate. 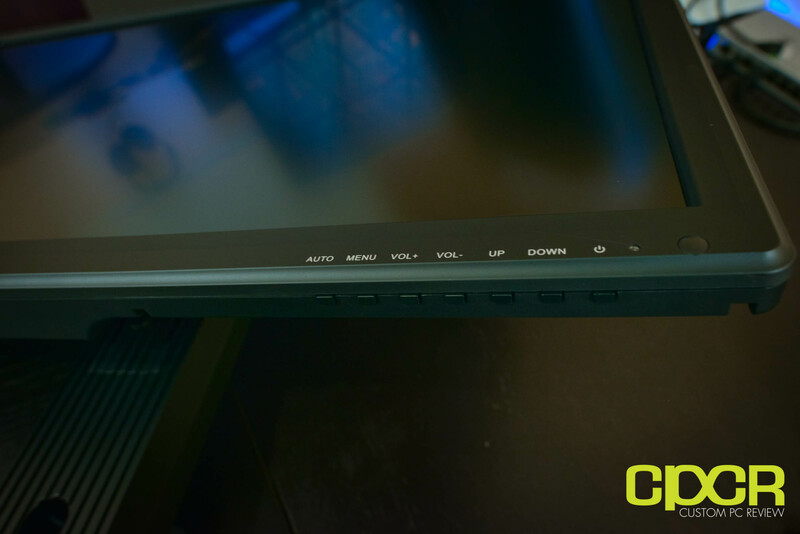 Recently, we were given the opportunity to be one of the first to review the EDG27, so let’s get to it! 3.5mm Audio Jack for use with external speakers or headphones. Here’s a look at the packaging for the Nixeus NX-EDG27 Gaming Monitor. Accessories included in the packaging include documentation, a power supply, a 5ft DisplayPort cable, a 3.5mm to 3.5mm cable, and the monitor stand along with included screws. Here’s a look at the EDG27. The monitor is a 27-inch monitor, so it’s fairly big and the 1-inch or so bezels don’t help it look any more compact. The design is fairly plain with simply a Nixeus logo at the bottom center of the bezel. At the bottom right corner of the EDG27 is seven buttons which include auto, menu, volume up, volume down and power. Pretty self explanatory even if you’ve never used a monitor. I/O connectivity on the include DC-IN, DVI, HDMI 1.4, HDMI 2.0, DisplayPort, 3.5mm in and a headphone jack. 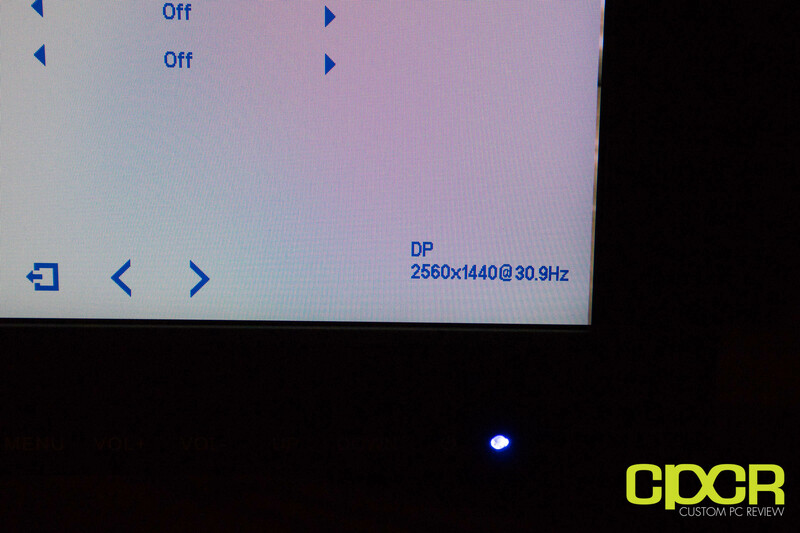 144Hz operation is only supported on the HDMI 2.0 and DisplayPort connections. The stand on the EDG27 is a fully adjustable stand with options to adjust height, tilt, swivel and rotate from portrait to landscape. The stand could use an improvement in terms of quality as it’s about as basic as a fully adjustable stand can get, but it does get the job done. Those who find themselves frequently adjusting the display may want to purchase a new stand with the monitor. 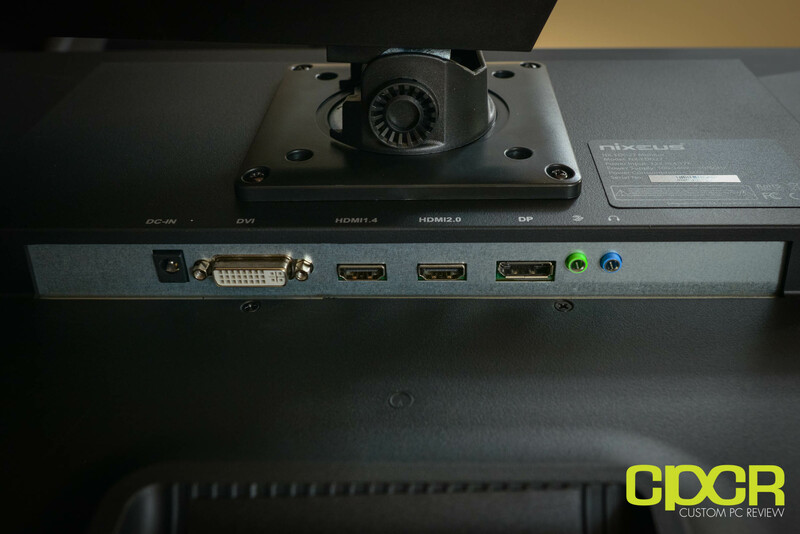 Luckily, the Nixeus NX-EDG27 is fully compatible with standard VESA mount stands and the panel itself is exceptionally light for a 27-inch monitor due to the external power supply. Cracking open the display housing, the first thing we see is the LCD panel. At the bottom left of the panel is an AUO Optronics logo. 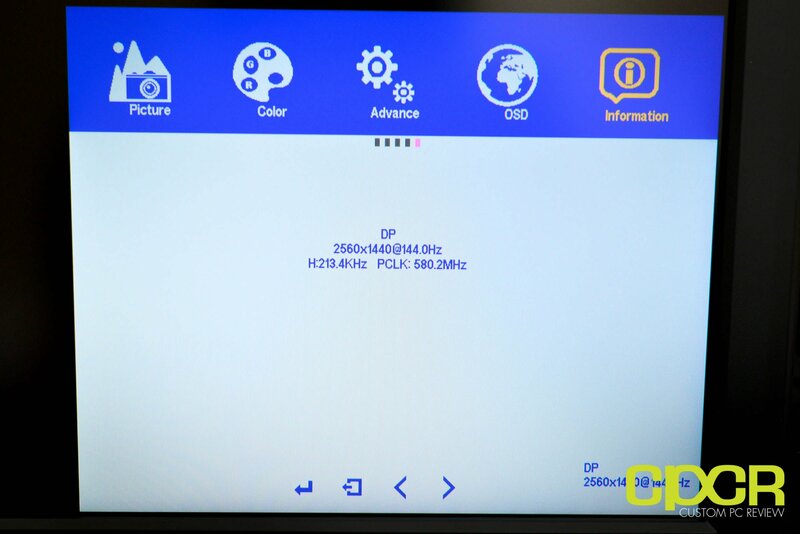 Flipping the panel over, we can see that the Nixeus NX-EDG27 packs the AUO M270DAN02.3 panel which is an AHVA (Advanced Hyper-Viewing Angle) panel. The panel is a true 8-bit panel which is capable of outputting 16.7 million colors. For those unfamiliar with AHVA, this is AUO’s version of IPS, which is why we’ve been referring to the panel as IPS over the course of the review. Here’s a look at the controller board, inverter board, and the integrated speakers. Nothing too fancy to describe here. 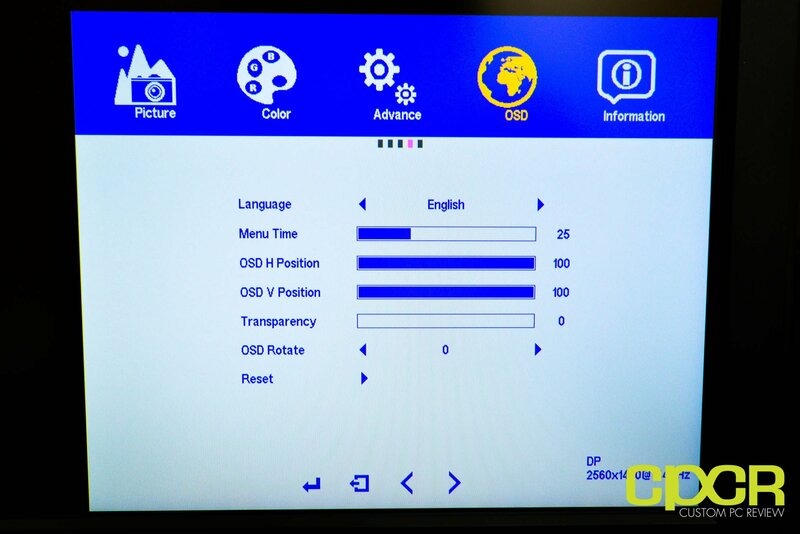 The OSD menu on the Nixeus NX-EDG27 is split into five categories: picture, color, advance, OSD, and information. 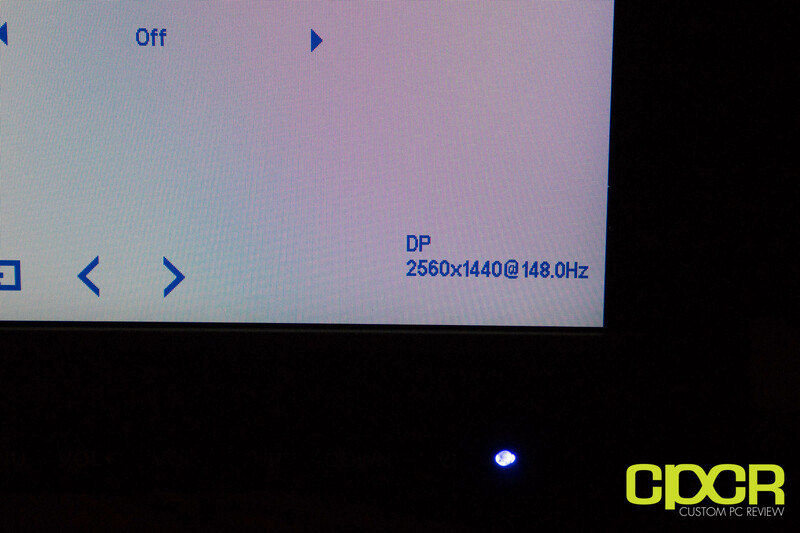 Control of the OSD is provided by the buttons on the bottom right corner of the display. The only thing strange about Nixeus’s implementation of the buttons is that the volume up is on the left side and the volume down is on the right, so when adjusting settings on the OSD, the left button moves the sliders to the right and the right button moves the sliders to the left. Slightly confusing, but setting up the OSD is usually a one time deal for most, so not a dealbreaker. Here’s a look at the picture menu. We have brightness, contrast, sharpness, aspect ratio, ultra vivid, and DCR. Ultra vivid which as far as I can tell doesn’t do anything. 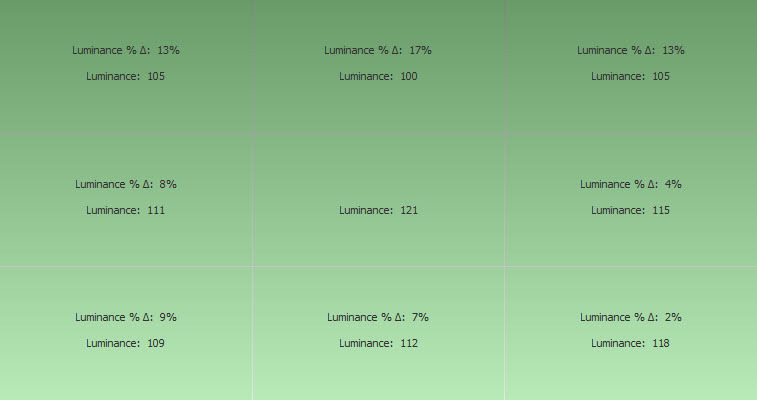 DCR will automatically change brightness/contrast for you based on ambient light. Under the color menu is the color effect, saturation, gamma, and temperature. The temperature can also be user set by changing to the user setting. Under advance is strangely enough volume and audio source. These options are for adjusting the onboard speakers. Additionally, there’s also DP option, overdrive and low blue ray. 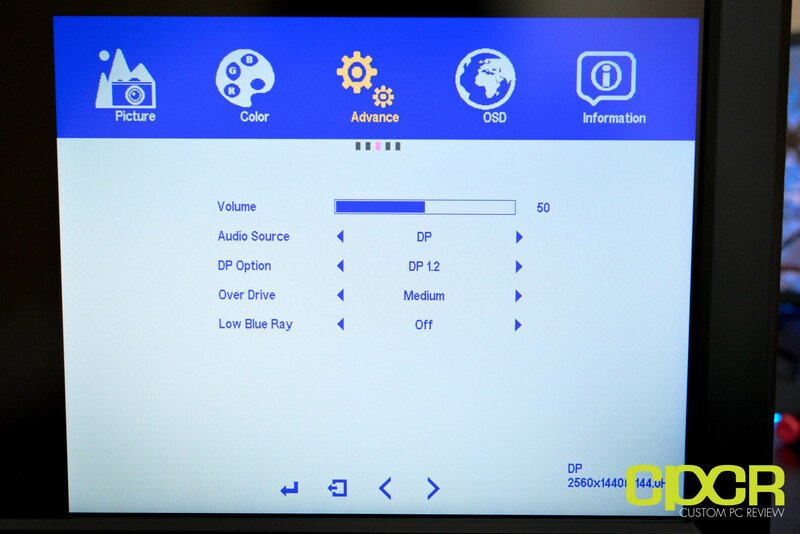 DP option allows changing from DP1.2 to DP 1.1 if needed, overdrive is for reducing ghosting which we’ll cover a bit later and low blue ray is an option to reduce the blue light in the display for more comfortable use at night. Under OSD, there are options to change the language, menu time, OSD position, transparency and rotate. Finally, the information tab shows which interface you’re connected on, the refresh rate, horizontal scan frequency and pixel clock. At the bottom right of the corner is also a status display which shows the connection information including a real-time display of the refresh rate. 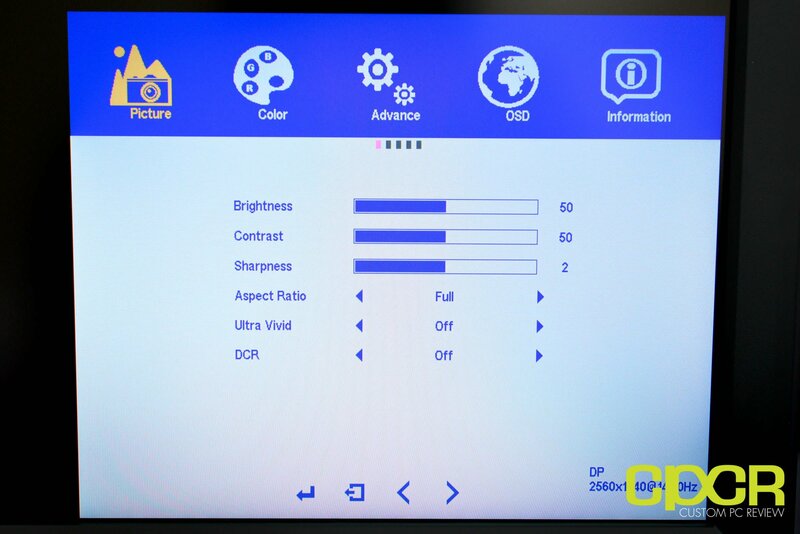 Color testing is conducted using the X-Rite i1Display Pro along with the included i1Profiler testing software. Out of the box, the Nixeus NX-EDG27 is set at a color temperature of 7054K, luminance of 166 cd/m², a gamma of 2.13, and a contrast ratio of 1234:1. 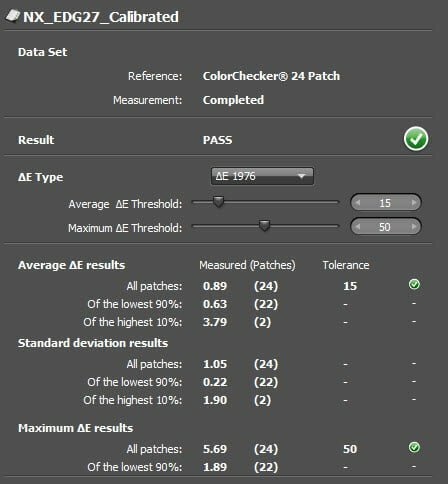 In order to calibrate the display, we set the calibration target to a white balance of 6500K, a gamma of 2.2, and a luminance of 120 cd/m². 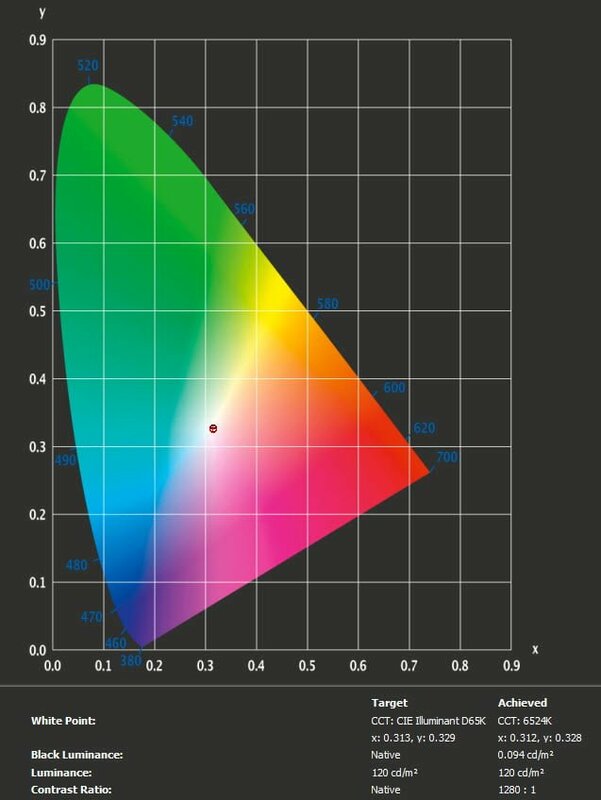 Once calibrated, the Nixeus NX-EDG27 was able to achieve a white point of 6524K, luminance of 120 cd/m², a gamma of 2.17 and a contrast ratio of 1280:1. This is achieved by setting the OSD settings of brightness to 33, gamma to 2.2, and RGB values to 128, 127, and 124 respectively. 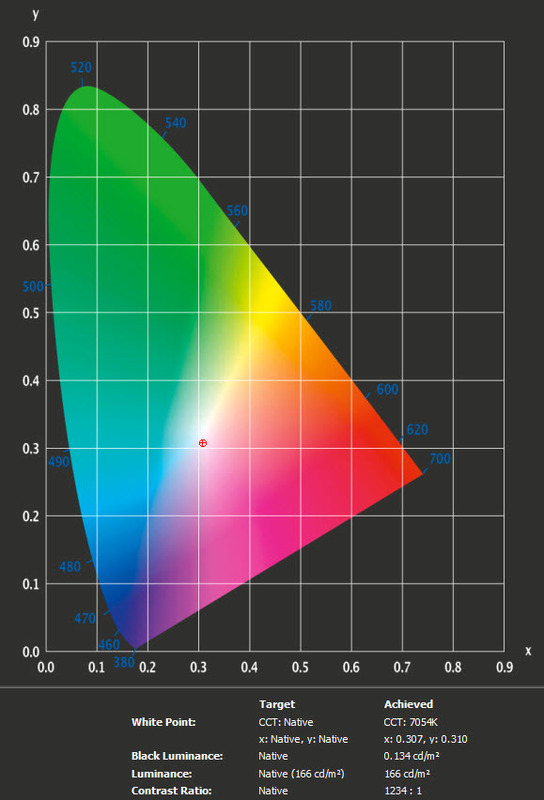 Color accuracy measurements were fairly good with an average ΔE of 0.89 and a maximum ΔE of 5.69. 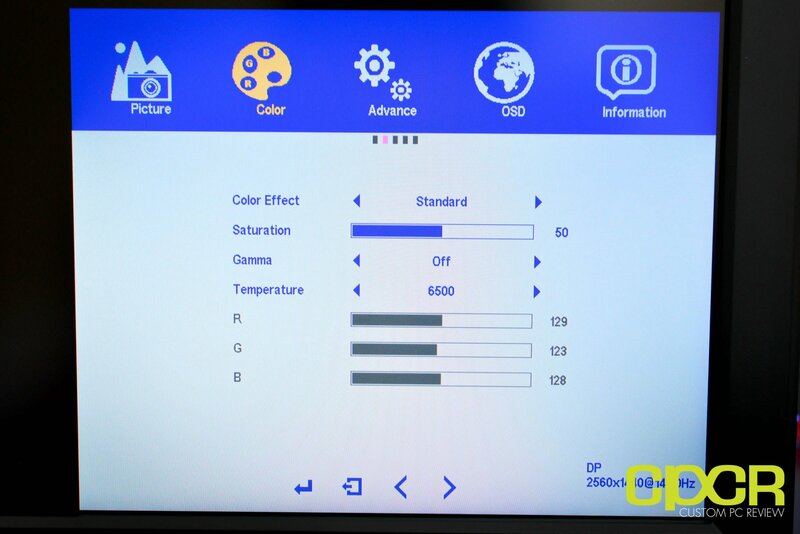 Testing the color gamut coverage of the NX-EDG27, the panel was able to display 108% of the sRGB color gamut and 74% of the AdobeRGB color gamut. This is expected considering we’re dealing with an AHVA panel and will be more than enough for the average user. Display uniformity testing is conducted using the X-Rite i1Display Pro along with the included i1Profiler testing software. Here’s a look at the display uniformity test at the calibrated settings. The Nixeus NX-EDG27 was able to reach a maximum brightnesss of 121 cd/m² at its center which is perfectly in line with our target of 120 cd/m². The biggest deviation from the center is the top 1/3 of the monitor with the top center of the screen showing about 17% deviance from center. In contrast, the bottom 1/3 and middle 1/3 of the display is relatively uniform with under 10% deviance from center. During display uniformity testing, we also scanned for any dead pixels and detected none. Here’s a look at the screen with a black image in a room with minimal lighting. 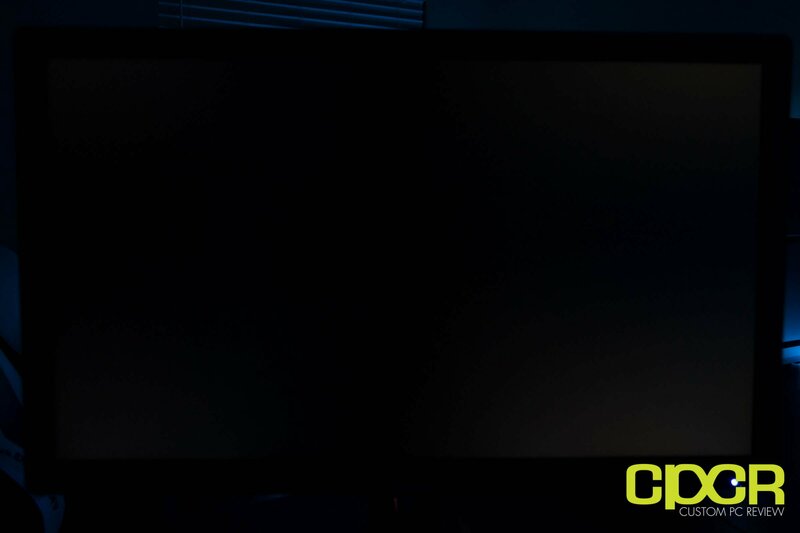 We can see that there’s some backlight bleed coming from each of the four corners with the most apparent coming from the top right and the bottom right of the screen. During backlight bleed testing, we also scanned for the presence of stuck pixels and detected none. Viewing angles are very good as can be expected of a monitor using IPS panel technology. There was little to no washing out of the image when viewed at an angle. 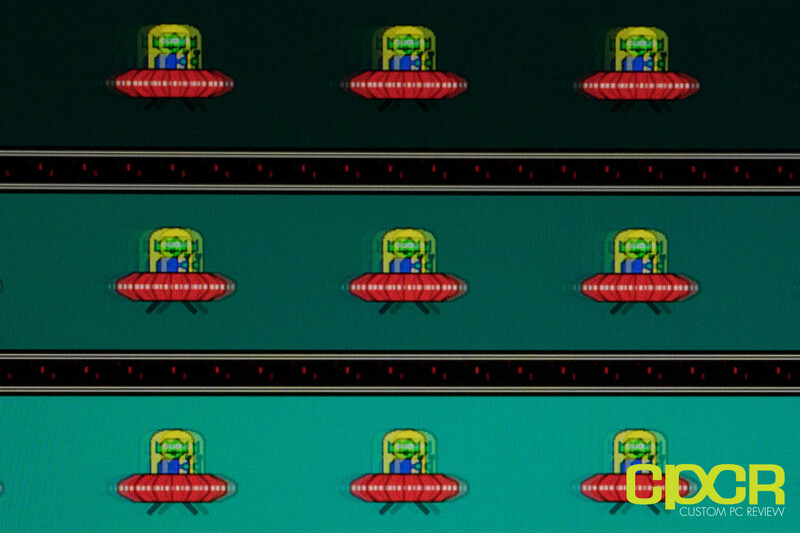 Overdrive is a feature on many newer monitors which increases the voltage of pixels in order to increase the speed at which the pixel’s colors change. The Nixeus NX-EDG27 has four settings for overdrive: off, low, medium and high. 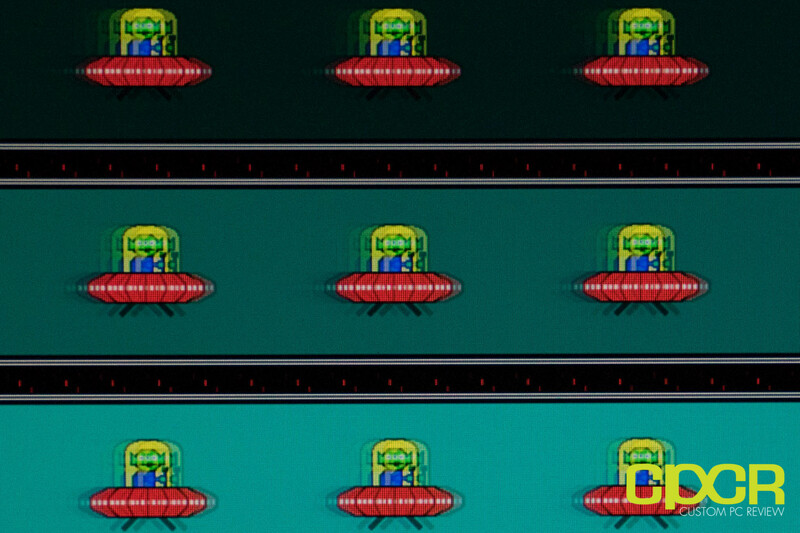 Interestingly enough, with overdrive set to off, medium or high, the resulting image has visible ghosting. At the low overdrive setting however, there is very faint to no visible ghosting. Unless Nixeus adjusts the overdrive settings in future models, the low setting should be used as the optimal overdrive setting for the NX-EDG27. The middle of the screen, typically where all the action happens, measured 9.5ms, which is a relatively low input lag time making this display well suited for gaming. Further, as DisplayPort is more efficient than HDMI, input lag time should be even lower than the number measured. As advertised, the Nixeus NX-EDG27 had no problems dynamically adjusting itself from 30Hz to 144Hz using FreeSync. Having such a wide range is important as framerates that drop below the minimum range of a FreeSync monitor may exhibit juddering or tearing. AMD has introduced the LFC (Low Framerate Compensation) feature to FreeSync which is now a required feature in FreeSync’s 2.0 implementation. When framerates drop below what’s supported by the monitor, LFC will kick in and insert additional frames to increase the framerate to ensure FreeSync continues to operate normally. That said, a lower minimum refresh rate is still superior. As the display already runs at 144Hz, not much was expected in terms of overclockability however, we were able to reach a stable 148Hz with the NX-EDG27. 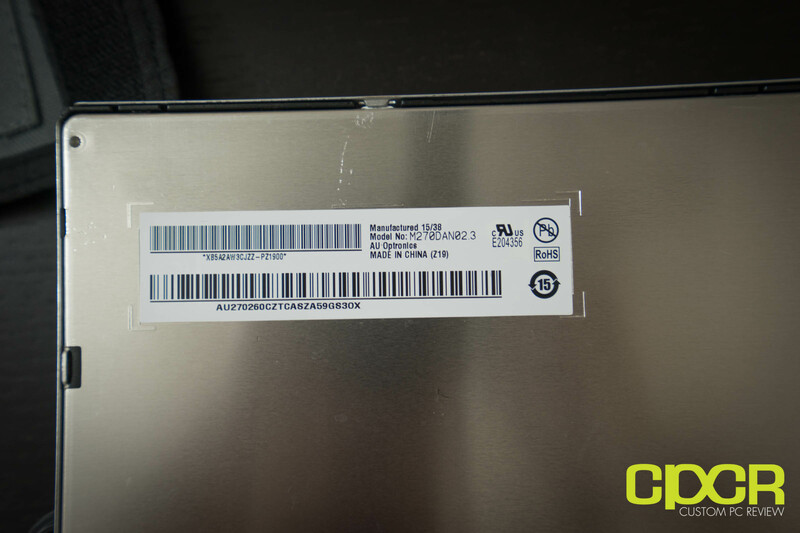 Nixeus doesn’t have a specification for the NX-EDG27’s power draw other than <50w which is listed on the sticker attached to the rear of the display. In use, the NX-EDG27 drew 0.3w at idle, 23.9w at the 33% brightness (calibrated), and 31.9w at 100% brightness. 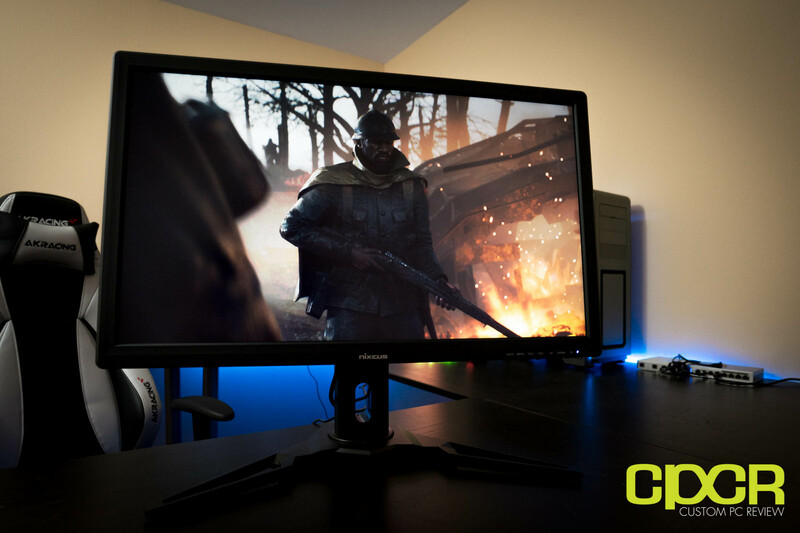 When Nixeus first revealed their NX-VUE24, it was a major gamechanger as it was one of the first AMD FreeSync monitors that was capable of showing off the full range of capabilities of FreeSync. Following in its predecessor’s footsteps, the NX-EDG27 is changing the game again with the same 30Hz-144Hz FreeSync range as its predecessor, but now also packs in IPS panel technology and, unlike many other IPS technology based monitors, packs an input lag under 10ms. In testing, the NX-EDG27 really did exceed expectations. Although a slight amount of calibration was required to get the monitor to its optimal output, the result is an excellent monitor that accurately displays color while also being capable of playing games with low latency and little to no studder. 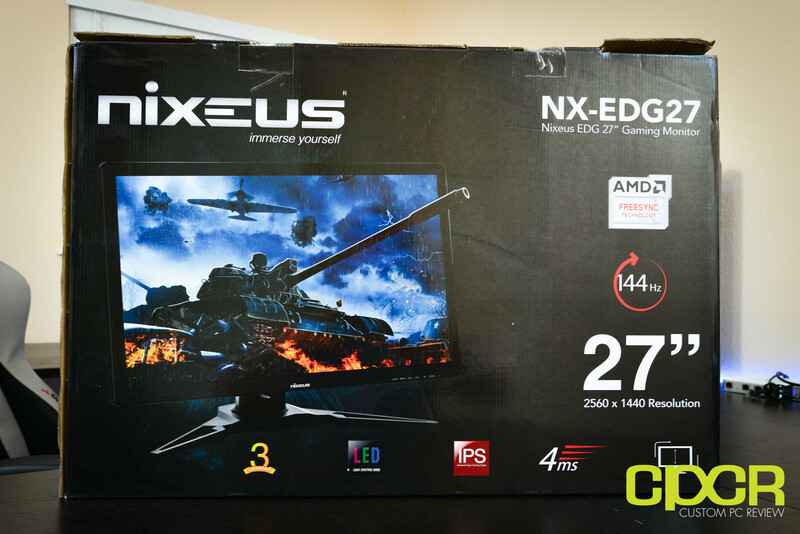 With all these features, you might be thinking you’re looking at a $700 monitor however, the Nixeus NX-EDG27 is expected to be priced at just $499 which is very competitive despite being a product really in its own league. Of course, to reach that pricepoint Nixeus has cut a few corners such as the relatively boring looking monitor design, the external power brick, and the relatively cheap stand, but let’s be honest, most of us don’t go out to buy a monitor to look at the casing or to adjust the tilt of the monitor every five minutes. 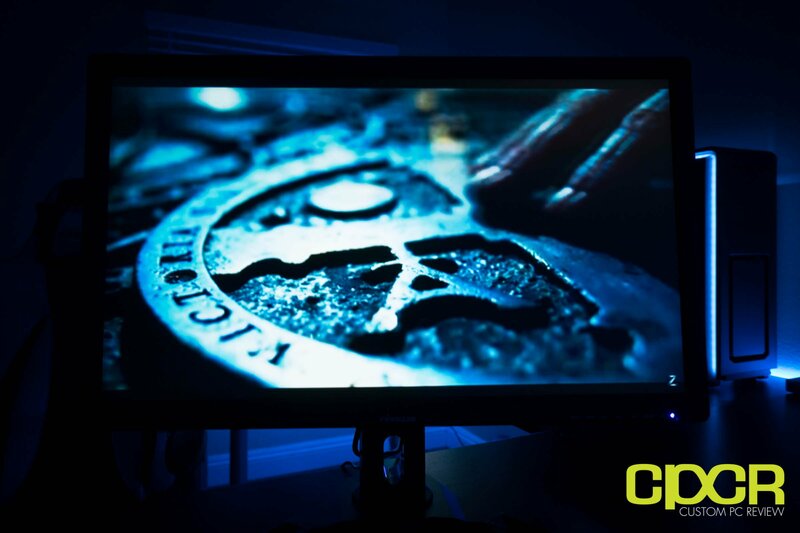 We buy a monitor to play games, browse the web, and edit photos on occasion. For that purpose, the Nixeus NX-EDG27 is an excellent choice. Highly recommended! Available at: Currently unavailable at this time. According to Nixeus, a new shipment of monitors is currently on its way and we’ll be updating this article as soon as it’s available. As promised, Nixeus reached out to us to provide some more information on availability and pricing for the EDG27. Nixeus also revealed to us a previously undisclosed SKU of the monitor, the NX-EDG27S. Nixeus NX-EDG27 – The Nixeus NX-EDG27 will be available at Amazon and Newegg at a MSRP of $499.99. Nixeus NX-EDG27S – The Nixeus NX-EDG27S will be available at Amazon at a MSRP of $449.99. This model will be an Amazon exclusive. The difference with the NX-EDG27S is that this model will feature a basic tilt stand rather than a tilt, swivel and rotate. 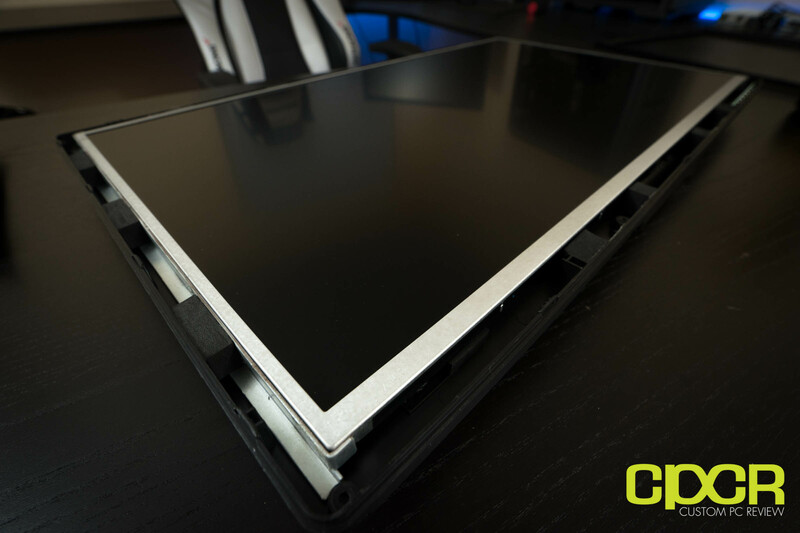 However, it will still feature a standard 100×100 VESA mount for compatibility with third party monitor mounts. 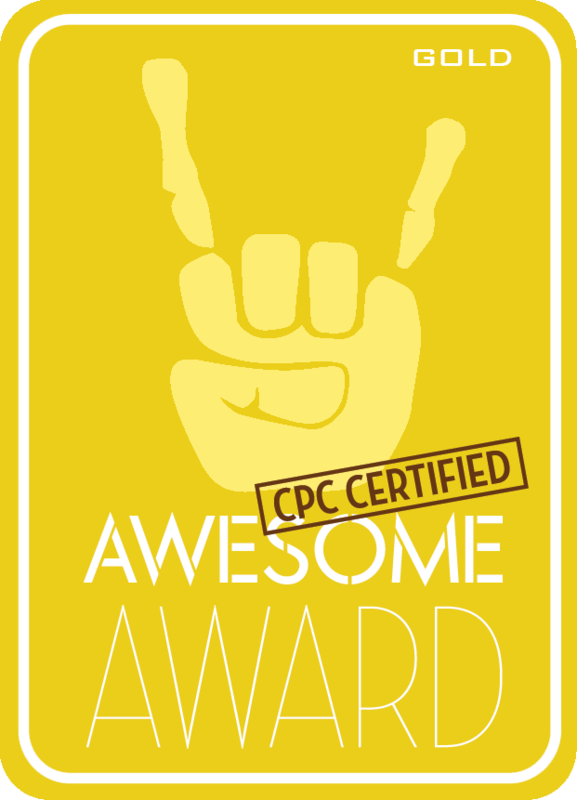 Sam Chen :Hardware and Technology Enthusiast. SSD Evangelist. Editor-in-Chief. Awesome review, excellent site. Keep up the good work. You wouldnt have an icc profile would you. Did you keep the contrast at 50?